The Urban Wilds Initiative seeks to protect the City's publicly-owned urban wilds and thereby ensure access and enjoyment of natural treasures to present and future Boston residents. As Boston's second largest unfragmented woodland, Allandale Woods is a crucial component of the city's natural areas inventory. Allandale Woods is located west of Arnold Arboretum on the Jamaica Plain/West Roxbury line and is bordered roughly by Allandale Street, Centre Street, the VFW Parkway, and Hackensack Road. The acquisition of a portion of the conservation land at Allandale Woods in 1975 represented the first step in creating the Charles-to-Charles Open Space Corridor, an 8-mile open space belt of existing parkland, private estates, and wetlands that stretches from the Fens and the Charles River Basin, along the Boston/Brookline boundary, and through the Sawmill marshes to the Charles River in West Roxbury. Composed primarily of oaks, maples, and pines, Allandale Woods is one of the few relatively pristine secondary growth oak-hickory forests in the city of Boston. Trails, recently rehabilitated in 2009 in partnership with summer youth conservation crews from Boston Natural Areas Network and Student Conservation Association, run throughout the site leading to various areas of interest including scenic Rock Pond, an extensive Depression-era stone boundary wall, a cattail marsh, intertwining streams that form the Bussey Brook headwaters, underground springs, an historic spring house, and a certified vernal pool. Tucked between the Forest Hills Station and the Arnold Arboretum, the Bussey Brook Urban Wild, also called the South Street tract, has recently been incorporated into the arboretum. As part of the annexation, a stabilized stonedust pathway was constructed through the wild from Forest Hills Station to South Street. Select areas were cleared of prior vegetation and replanted. However, the majority of the site remains in its former condition. Boasting a small section of the Stony Brook, this is the last area where the brook can be seen before it is funneled into the conduit to the lower basin of the Charles River. 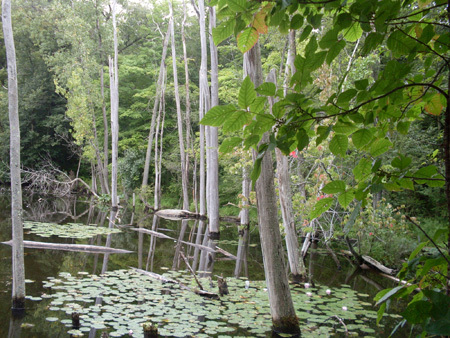 As a low-lying area, the wild is composed of a marsh and upraised filled land. Formerly part of a quarry, Nira Rock consists of two major sections, an upper section and a lower section. The two sections are about equal in size. The upper section consists of a puddingstone outcropping, about forty-feet high. The east, north, and west sides of the outcrop are bordered by steep, rocky slopes and shrubby woodlands. The southeastern portion of the rock ascends gently from the end of Arcola Street. A mown path leads to the top of the rock providing good views of the Jamaicaway. The lower section of the site can be accessed from the end of Nira Avenue, or by following the trail down from and around the rock. It is maintained as an open meadow/orchard, with yearly mowing required to prevent the establishment of dense woody vegetation. The meadow/orchard can also be accessed from the Hennigan Schoolyard and the recently-renovated Jefferson Playground. The UWI and the Friends of Nira Rock developed a renovation/restoration plan in 2005, and have been implementing the plan in phases as funding becomes available.